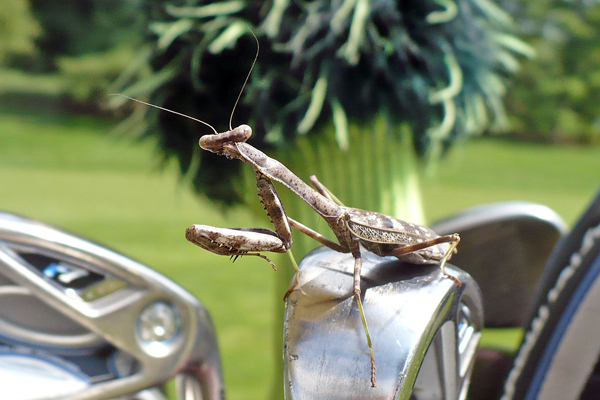 Isn’t it ironic to find a praying mantis on the golf course? For me, the answer is a resounding yes. I find myself praying to the golf gods on a regular basis, as it seems that no matter what you do or how you do it, there’s some sort of otherworldly power that creates the outcome once you’ve hit the ball. Golf is unlike the other sports I play. When you think you’ve mastered a skill (no matter how small), the moment you say to yourself, “OK, I get it. I need to do X to get Y” it’s wrong. That’s when your brain jumps in and messes everything up. Suddenly, your grip shifts, your balance is off or you swing harder because now that you’ve “got it” why not go for even more distance? It turns out that when you just stand over the ball and think about nothing, that’s when the ball flight is straight and true and you’re on the green in regulation. But trying to tell your brain to think about nothing while you look out over the pond you have to clear is about as easy as spotting a praying mantis sitting on your 8-iron. Oh, yeah, Cameron named him Frankie. After playing with this male praying mantis for a few minutes on the fairway of the fifth hole, Cameron relocated him to the safety of the adjacent woods. Well, then again, it might not have been safer, but thankfully for Frankie the golf gods were looking out for him on this hole. Great shot, I love the mantis. It is a cool insect, that’s for sure! Great photo. Have you ever played combat golf?? When at the tee and your opponent is about to swing, ask them if they breath in or breath out before they swing.Works every time!! They will be thinking about that for the next 5 holes!! Oh yeah…your body already knows how to swing a club…just walk up to the ball, aim and hit it. From the book Inner Game Of Golf or Tennis. No, I’ve not heard of combat golf. Very useful information! I have a few people in mind for this question…I’ll let you know how it goes 😉 It is fascinating how often your brain interferes in your best efforts in sports. Too bad we don’t have an on and off switch! Thank you, Nia! You are so kind! What a great photo of Frankie! I enjoyed your story as well. I read it to my husband. He could relate to the description of thinking you have mastered the game of golf!